Prof. Orna Ben-Naftali, the Emile Zola Chair for Human Rights, the Haim Striks School of Law, Israel. Moderator: Dr. Sam Muller, director of the Hague Institute for the Internationalisation of Law (HiiL). Nada Kiswanson van Hooydonk, EU Advocacy Officer at Al-Haq. Since Israel conquered the territories of the West Bank and Gaza Strip in 1967, the military has imposed thousands of orders and laws, established military courts, sentenced hundreds of thousands of Palestinians, enabled half a million Israeli settlers to move to the Occupied Territories and developed a system of long-term jurisdiction by an occupying army that is unique. Those entrusted with creating this new legal framework were the members of Israel’s military legal corps. Responding to a constantly changing reality, these legal professionals have faced (and continue to face) complex judicial and moral dilemmas in order to develop and uphold a system of long-term military “rule by law” of an occupied population, all under the supervision of Israel’s Supreme Court, and, according to Israel, in complete accordance with international law. The film raises the most profound questions regarding the very possibility of the rule of law (which is its title in Hebrew) in a prolonged occupation: what are the relations between power and law, law and justice, the State and human rights? Does the very notion of ‘the rule of law’ have meaning in non-democratic regimes, that is, when applied to people essentially deprived of political rights? How does justice function when the functionaries themselves admit that they regard the people as ‘the enemy’? How do the judges justify sending a mother to jail for having given pita-bread to Palestinian fighters? Or having provided legal advice designed to legalize the settlement enterprise? Or serving a system that allows for the operation of two legal systems, one for Jews and one for non-Jews, in the same territory? What has been the impact of the unprecedented decision to allow the occupied Palestinians to appeal to the Israeli High Court of Justice and who were the main beneficiaries of this ostensibly ‘enlightened’ decision? This film provides a rare opportunity to ponder the banality of (judicial) evil; of lawyers as the willing executioners of power. The presentation following the screening will focus on these questions, and further discuss them in the light of the recently published report of the independent international fact-finding mission established by the UN Human Rights Council to investigate the implications of the Israeli settlements. 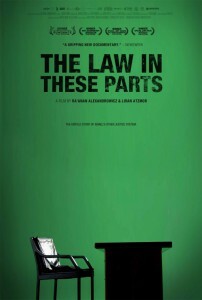 The Law In These Parts has won the World Cinema Grand Jury Prize in Documentary at the Sundance Film Festival (2012), the Special Jury Prize in the International Feature Competition at Hot Docs Festival in Canada (2012), and the Special Jury Award in the Full Frame Documentary Festival (2012). The screening is organized by gate48 – Platform for critical Israelis in the Netherlands, in cooperation with Palestine Link, FFIPP – Faculty for Israeli-Palestinian Peace and De Balie.